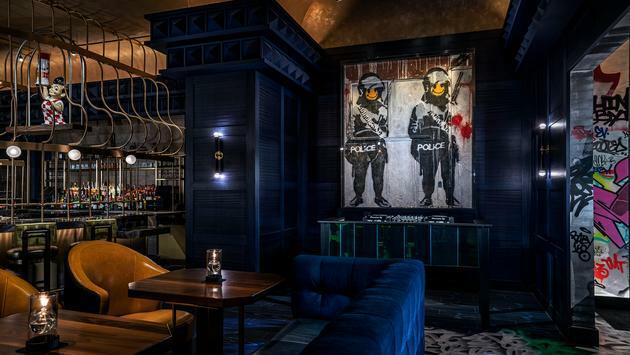 Palms Casino Resort is welcoming the first permanent Banksy work to Las Vegas in their new restaurant, Greene St. Kitchen. 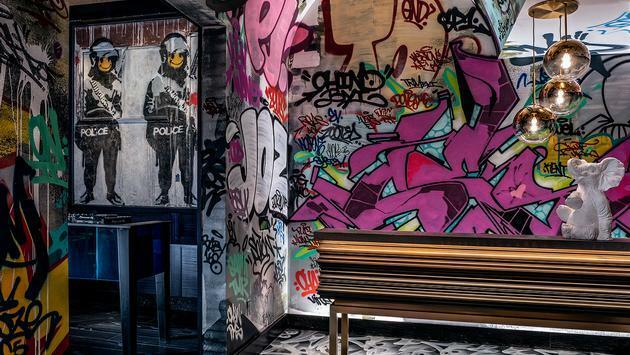 Starting on Monday, March 18, Palms Casino Resort will be debuting a collection of street art in Greene St. Kitchen and Banksy will be among one of the many famous street artists featured. Titled Smiley Coppers Panel 1 (2002), the 88.25-inch by 74-inch piece by Banksy features two spray-painted heavily armed police officers that have neon yellow smiley faces. Banksy will be joined by other street artists and graffiti names like Kenny Scharf, Cleon Peterson, VHILS, Pose, Martha Cooper, Slick and DabsMyla in a mazelike series of five spaces in Greene St. Kitchen. The restaurant has a speakeasy video arcade with a secret door that leads through a tunnel decorated in a New York-style graffiti mural by CES. “You can spend all day in there and think you catch everything and the next day you find something new,” says Palms’ Creative Director, Tal Cooperman, of the artwork. Banksy and the work of the other street artists debuting in Green St. Kitchen today will be among good company at the Palms Casino Resort which showcases work by other famous artists like Damien Hirst, Andy Warhol and Jean-Michel Basquiat.